Thinking of a classic coffee cake—you're thinking almond of course! 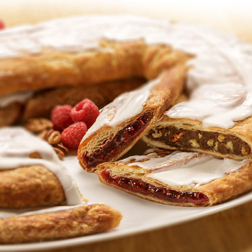 Our traditional flaky Danish pastry is handcrafted into seven individual rolls filled with almond and custard. 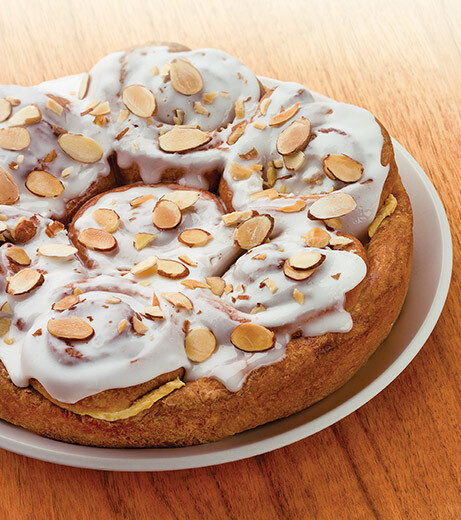 Vanilla icing and toasted slivered almonds make this perfect for serving at breakfast, a morning meeting or simply as a dessert! Contains egg, milk, soy, wheat, almonds. Due to processing on shared equipment, may contain traces of peanuts, walnuts, pecans, coconut, or macadamia nuts. Wheat Flour, Sugar, Butter/Margarine Blend ((Butter(Milk), Palm Oil, Interesterified Soybean Oil, Soybean Oil, Water, Salt, Mono and Diglycerides, Annatto/Turmeric Color, Natural & Artificial Butter Flavor, Calcium Disodium EDTA, Vitamin A Palmitate Added), Corn Syrup, Apricot Kernels, Almonds 2% Or Less of the Following: Modified Tapioca Starch, Carageenan, Eggs, Milk Solids, Soy Lecithin,Soy Protein, Dextrose, Yeast, Natural & Artificial Flavors, Calcium Carbonate, Yellow 5, Yellow 6, Gluco Delta Lactone, Maltodextrin, Guar Gum, Preservatives (Tocopherols, Calcium Propionate, Potassium Sorbate, Sodium Benzoate), Agar-Agar, Malted Barley Flour, Corn Starch, Color Added.